Art Starts... and it Just Keeps on Going! As school wraps up for another year, we want to thank all the amazing teachers and school administrators across BC who work with such passion, dedication, patience and creativity to bring learning alive for students. We are especially thankful to witness, learn from and collaborate with educators who value the importance of incorporating creativity into their daily practice, allowing young people to learn, share and grow through the power of the arts. Today, we have a very special guest contributor to the ArtStarts blog, one such teacher who knows firsthand how the arts can have a postive impact—on both herself and and her students. Laura Anne Berardinucci is a Grade 2 teacher at Caulfeild Elementary in West Vancouver. 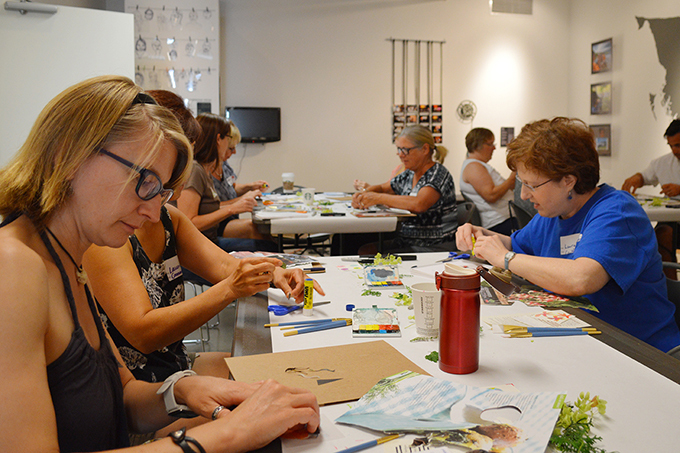 We've had the pleasure of having "Mrs. Bee" attend several Infusion professional development workshops at ArtStarts. We asked her to share some of her thoughts about her learning with ArtStarts and how she brings creativity into her own classroom. Also be sure to read on to find out how YOU can take part in our upcoming Summer Camp Pro-D workshops. 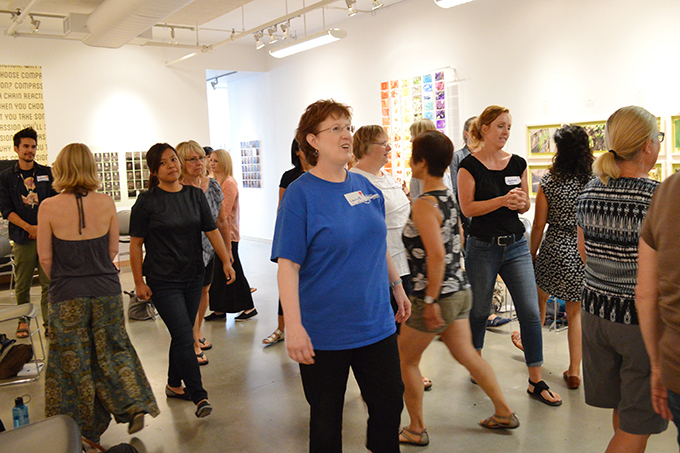 Yes, there are educators out there who are just as passionate about teaching through the arts as I am—and I found them at ArtStarts. Amidst the hustle and bustle of the downtown Vancouver core, you'll find the ArtStarts Gallery, thoughtfully decorated with student art: the result of collaborative endeavors between K-12 students from across BC and professional artists. Each time I visit, I am eager to see what new projects will be on display and this helps me to envisage what is possible, especially the projects with First Nations influence. Most recently, this experience inspired my colleagues and me to work with a First Nations storyteller and weaver for our math unit on patterns. 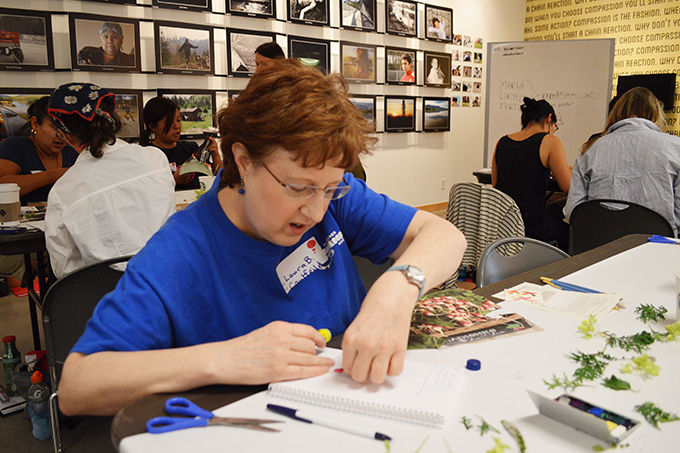 The workshops at ArtStarts are always structured to make even the most reticent person feel perfectly safe while exploring a vast array of art forms. That sense of "safety" is paramount and once you have experienced it for yourself, you can easily imagine how to recreate it for your students. For example, during one of the warm-up activities, each member of the group took turns with an imaginary broom and through actions, turned the "broom" into a different object, such as a horse, a sword, the handle of a paint roller and so forth. Nobody was pressured to take the lead: whoever felt inclined, merely stepped into the circle at an appropriate time to "take over", so to speak. I actually tried this activity with my Grade 2 students and they loved it! This was an effective way of encouraging students to tune into one another, take turns and exercise their creative brain cells! Another workshop that had a profound influence on me was called Design a Daily Creative Practice, presented by Marisa Pahl. I had often read about artists who follow some form of daily ritual that helps to unblock them and let the creative juices flow. How could I do this in my classroom without students asking me, "Miss Bee, what do I draw?". This year, for the first time, I decided to try a new routine and so far, it is working very well. Upon entry, I greet the students and after they have hung up their clothes, they take their Daily Drawing book from a nearby table and quietly draw at their seating while waiting for the morning music and announcements. They continue to draw afterwards and this allows me time to take attendance, collect forms and check their planners while providing them with a calm way to start the day. Sometimes students bring in objects that they want to sketch or they use photos from a book as inspiration, but usually they draw from their imaginations. Some students will spend over a week on adding details to drawings while others make abstract designs and play with colours. Dia Davina, an affecting poet and spoken-word artist, recited an extremely powerful and moving poem during another workshop that set the tone for a session on having the freedom to play with words, combine them into a "poem" and voluntarily recite them. Entitled Page and Stage, this included activities such as describing an emotion without ever mentioning the word; members were divided into groups and each group was given a "secret" emotion. Each group worked collaboratively to brainstorm phrases that described the emotion without actually stating it. These phrases were recited to the other groups thereby giving the audience clues as to what the emotion was and then giving them the chance to guess it. This was a perfect example of an activity that can be adapted to any grade level. 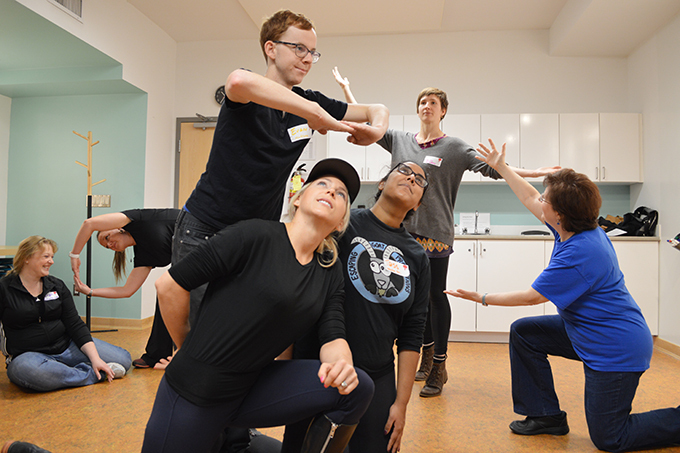 Susan Bertoia, an ebullient theatre artist, led the group of participants through an energetic, fast-paced journey into the world of physical theatre. Most significant was how quickly it became apparent that drama is an excellent medium for addressing the Core Competencies as the "tableau" exercises motivated everyone to collaborate, problem-solve, and use creativity. In terms of curriculum, paintings were projected onto the wall as inspiration, and all members re-enacted the scenes, which could be used as springboards for Social Studies, Language Arts and Visual Arts. The day ended with a plenary, allowing all participants to reflect on the day and share how they would use the program's activities in their own classrooms. 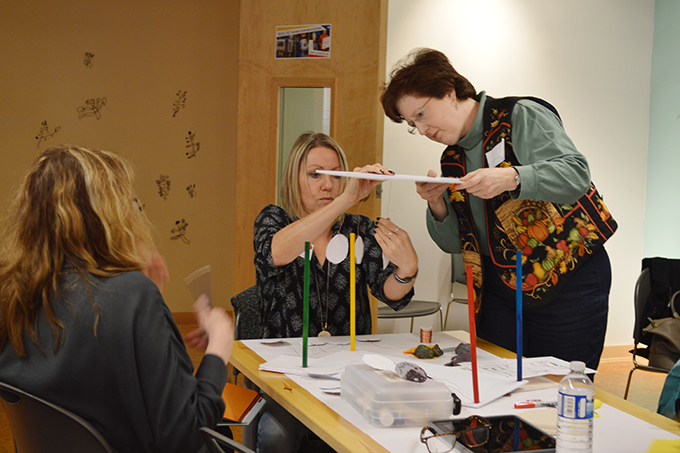 As well, connections were made between the material covered throughout the day and the implementation of the revised BC curriculum. In addition, references, workshop notes, and resources were emailed to all workshop participants, which removed the copious and tedious note-taking that so often breaks the flow of learning during so many typical workshops. Thus far, I have attended four professional development days at ArtStarts—two on the province-wide Pro-D Day in October and two during the Summer Camp in August—and I look forward to many more in the future! But you do not have to wait for the next professional day: visit the gallery, the resource centre that houses an impressive collection of books about creativity and arts integration, and especially the wonderful people who work there! If I may end on a more personal note, one of the most memorable occasions for me at ArtStarts was when I convinced one of my reluctant colleagues to venture into the arts frontier. This was definitely out of her comfort zone: my colleague prefers the realm of Math and Science and is by far a master educator. By the end of the day at ArtStarts, my colleague had come out of her shell and to witness this transformation brought tears to my eyes. I owe this of course to the expert clinicians at ArtStarts who create a safe zone for everyone to flourish. Now it's YOUR turn! Come to Summer Camp! 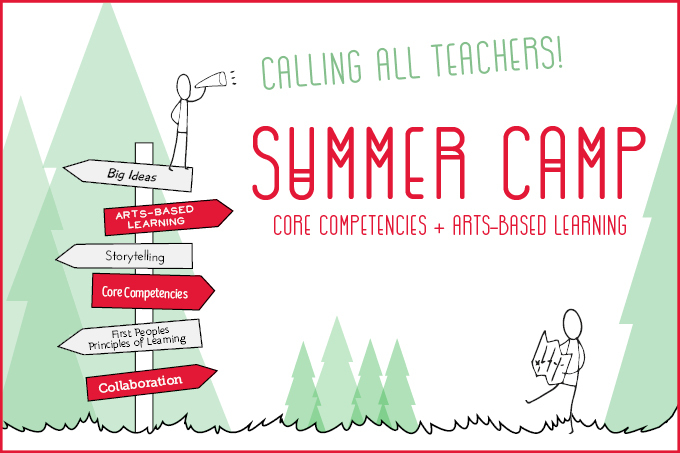 Our next Infusion professional development event at ArtStarts is Summer Camp: Core Competencies + Arts-Based Learning, taking place in Vancouver on August 21-22, 2017. Early Bird rates are available until June 30! Spaces are limited. Register for Summer Camp now!